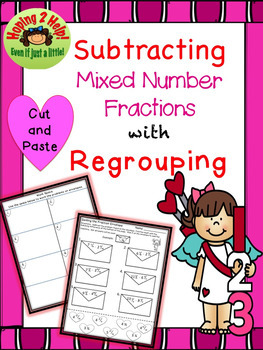 the understanding of subtraction involving regrouping of mixed numbers. This worksheet has six problems which all involve regrouping. I have included a page to be copied on the back (if you like) that is to be used as the workspace for each problem. This workspace has been beneficial for me, as the teacher, to see where a student may be struggling while solving problems with fractions . 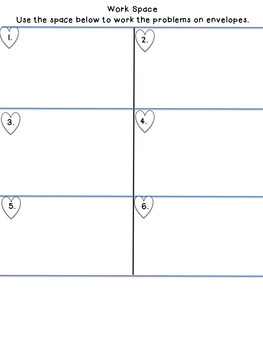 Students will solve the problem and find the matching difference on a heart at the bottom of the page. 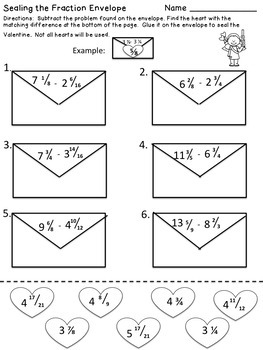 Your student will cut out the correct heart and paste it on the envelope beneath the problem. There will be one heart not used. 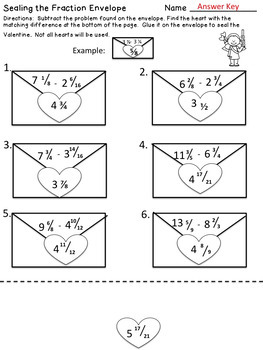 This worksheet was made with the teacher in mind – easy and quick checking! !